Scene markers are visual indicators displayed at the top of the timeline in the frame counter area. You can use it to denote anything relevant to your work. You can indicate at the frames you want to clean up, a change in action, an impact, or where you intend to apply an effect. You can also add a note to a scene marker, which is displayed when you hover over the scene marker. There are two ways to add a scene marker. You can make a frame range selection and mark that whole section or simply mark the current frame. 1. In the Timeline view, make sure the playhead is set on the frame you want to mark. Even if you right-click on a different frame, the scene marker will be created on the current frame, which means where the red playhead is. 2. Right-click in the frame counter area and select Scene Markers > Mark Current Frame. The Timeline Scene Marker dialog box opens. The Colour box displays a black colour swatch, or the colour of the last scene marker you created. 3. Double-click the Colour box to select a colour for your scene marker. 4. 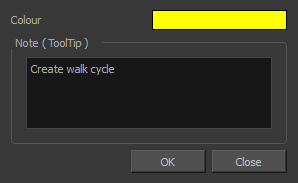 In the Note field, enter text to display a tooltip. 6. In the Timeline view, the scene marker is displayed at the current frame. Hover over the scene marker to display its note as a tooltip. 1. In the Timeline view frame counter, select the frame range on which you want to mark your scene. 2. Right-click and select Scene Markers. 3. Click the colour swatch and select a colour for the scene marker. 4. In the Note field, enter text to display as a tooltip. 6. In the Timeline view, the scene marker is displayed over the selected frame counters. Hover over the scene marker to display its note as a tooltip. If you select only a part of a scene marker, you will not open the scene marker for editing. You will only be able to create a new scene marker to overwrite it. 1. In the Timeline view frame counter, select the entire scene marker. 2. Right-click the selection and select Edit Scene Marker. 1. In the Timeline view frame counter, at least one frame counter in the scene marker you want to delete. 2. Right-click the selection and select Delete Scene Marker.